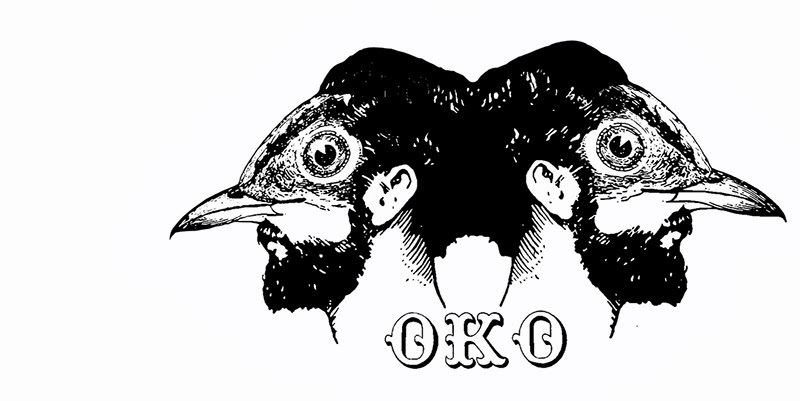 Oko’s phantasmagorical images of humans with birds’ faces, or dreamy patterns woven from what look like entrails, are decorative and disturbing in equal measure. Stuck to surfaces throughout the city, Oko’s pictures look like prints or photocopies; they are in fact painted on thin paper with acrylics before being glued to the wall of her choice. Oko coined the phrase, ‘the city as a confessional booth’, to help explain her relationship with public space. One of her earliest ever works involved writing her fears and frustrations on bits of paper, folded them up and put them in test tubes, which she then hung in various locations around the city to be discovered by strangers. Q: How did you become a street artist? A: Like most things in life, it happened in a blink. One day I made a few stickers and put them up in the street. It gave me a feeling of complete freedom, and that’s the main reason why my art has stayed on the street ever since. Q: How did you choose Oko as a name? And why do you sometimes refer to yourself as ‘Oko the Blind’ on your blog? A: It’s a combination of the idea of the all-seeing eye, the eye of God, but also the inner eye that allows us to see things and appraise a situation emotionally. A: The bird-faces are a symbol of freedom, of something pure. I read somewhere that birds are carriers of the soul after death, and I was really inspired by that idea. A: Each of those tattoos for me had a specific meaning, which neither needs nor wants to be understood by the general public. It was important for me for a moment to feel that stability offered to you by a permanent address, and as usual I turned to the street. Q: Which of your street works should visitors make a point of going to see? A: Probably the one on the Branimirova graffiti wall, the one made up of big wooden panels. Q: Many people in Zagreb have heard of street artists like Oko, Filjio and Puma 34, but are unsure of whether these are individual artists or group labels. Can you put the record straight?